"Those Ignorant, Stupid, Insane, Wicked Creationists"
[NOTE FROM APOLOGETICS PRESS: Our monthly journal on Christian evidences, Reason & Revelation, normally is published according to a pre-arranged syllabus. Article topics are selected months in advance, and appear in a pre-determined order. The September 2002 issue, however, represented an exception. And we felt that an explanation was in order for our subscribers, and those who visit our Web site. During the months preceding September 2002, the controversy in the United States over the teaching of creation and/or evolution became increasingly public, and increasingly hard-fought. As state legislatures, boards of education, and others in positions of authority ventured into the fray by expressing their willingness to consider options to the teaching of organic evolution as the sole explanation for the origin of the Universe and life in that Universe, the battle over what should, or should not, be taught in public schools heightened considerably. Enough is enough! No amount of pejorative terminology on the part of editors and journalists is going to make the scientific evidence supporting creation somehow “disappear.” And no amount of intellectual snobbery on the part of materialistic scientists is going to make the woefully weak case for evolution somehow “stronger.” A significant segment of our work at Apologetics Press is devoted to the proclamation of biblical and scientific truth. And a similarly significant segment is devoted to the defense of that truth. We therefore produced a special issue of Reason & Revelation—“Creationists Fight Back!”—that was intended to do both. The misinformation presented by the editors of Scientific American and U.S. News & World Report, as well as the erroneous conclusions that misinformation was intended to convey, need to be exposed and refuted. And the truth of the matter needs to be heard. It used to be that the only things certain in life were taxes and death. According to journalist Thomas Hayden, we now can add organic evolution to that list. The latest effort to shore up the ever-faltering theory of evolution was the cover story of the July 29, 2002 issue of U.S. News & World Report. In explaining “how evolution works, and why it matters more than ever,” Hayden stated: “It’s an everyday phenomenon, a fundamental fact of biology as real as hunger and as unavoidable as death” (2002, 133:43). Mr. Hayden’s grandiose claim notwithstanding, organic evolution is neither “as real as hunger” nor as “unavoidable as death.” Yes, the slick graphics and full-color photos presented in Hayden’s article are impressive. And yes, the diminutive amount of alleged scientific evidence tossed in for good measure no doubt will convince some unsuspecting readers that evolution is indeed a “fact.” But the actual evidence tells an entirely different story. Sadly, this type of grandstanding and propagandizing in the media occurs all too often. And many people accept it as the “final word” on the subject—without any real knowledge as to what the evidence truly reveals. Given that millions of people read and respect U.S. News & World Report, we felt a thorough review of “The New Reality of Evolution” was in order. Someone needs to tell—if we may borrow a well-known phrase from respected news commentator Paul Harvey—“the rest of the story.” Here is that story. NUTS AND BOLTS—OR JUST NUTS? At present, science has no satisfactory answer to the question of the origin of life on the earth. Perhaps the appearance of life on the earth is a miracle. Scientists are reluctant to accept that view, but their choices are limited; either life was created on the earth by the will of a being outside the grasp of scientific understanding, or it evolved on our planet spontaneously, through chemical reactions occurring in nonliving matter lying on the surface of the planet. The first theory places the question of the origin of life beyond the reach of scientific inquiry. It is a statement of faith in the power of a Supreme Being not subject to the laws of science. The second theory is also an act of faith. The act of faith consists in assuming that the scientific view of the origin of life is correct, without having concrete evidence to support that belief (1977, pp. 62-63, emp. added). Four years later, Nobel laureate Sir Francis Crick, co-discoverer of the structure of the DNA molecule, wrote: “An honest man, armed with all the knowledge available to us now, could only state that in some sense, the origin of life appears at the moment to be almost a miracle, so many are the conditions which would have had to have been satisfied to get it going” (1981, p. 88, emp. added). Another four years later, in 1985, evolutionist Andrew Scott authored an article in New Scientist on the origin of life titled “Update on Genesis,” in which he observed: “We still know very little about how our genesis came about, and to provide a more satisfactory account than we have at present remains one of science’s great challenges” (1985, 106:33, emp. added). “One of science’s greatest challenges” indeed! [S]o far, no geochemical evidence for the existence of a prebiotic soup has been published. Indeed, a number of scientists have challenged the prebiotic soup concept, noting that even if it existed, the concentration of organic building blocks in it would have been too small to be meaningful for prebiotic evolution (pp. 138-139). Actually, that’s no surprise. Eighteen years earlier, the late British evolutionist Sir Fred Hoyle had gone on record as stating that the notion of life—with its incredibly intricate genetic code—originating by chance in some sort of primordial organic soup was, to use his exact words, “nonsense of a high order” (1981, 92:527). When Hayden told his readers that “scientists have confirmed virtually all of Darwin’s postulates,” he seriously misled them. The beginnings of life on Earth remain “unconfirmed.” And since all of evolutionary theory is based on those alleged naturalistic beginnings, by definition, evolution itself similarly remains “unconfirmed.” A concept based on an assumption cannot be considered “proven,” and, in fact, never can be anything more than an assumption itself. Such is the nature of logic. And speaking of logic, that brings us to Mr. Hayden’s next point. He wrote that evolution’s ironclad status is due to Darwin’s “extensive observations and cast-iron logic” (p. 44). In an effort to build a strong foundation, Hayden built Charles Darwin into a self-assured, intellectual giant. Yet anyone even vaguely familiar with Darwin’s Origin of Species, knows that Darwin was plagued by self-doubt. As British evolutionist H.S. Lipson observed: “On reading The Origin of Species, I found that Darwin was much less sure of himself than he is often represented to be; the chapter entitled ‘Difficulties of the Theory’ for example, shows considerable self-doubt” (1988, 21:6). Darwin knew his theory was filled with sizable holes that he could not fill. Almost a century-and-a-half later, it still is. It cannot explain how organisms arise above the species level (e.g., genus, family, order, etc.). It cannot explain how, when the large majority of mutations are “bad” (and most of the rest are neutral), “good” results are required to change one type of animal or plant into another type of animal or plant. It cannot explain the origin, much less the complexity, of the genetic code. It cannot explain the “Cambrian Explosion” in the fossil record, where incredibly complex “early” structures and organisms suddenly appear fully formed and completely functional (such as the dual lens system and accompanying refractive interface of the trilobite’s eye). And so on. Then, of course, there is the oft’-overlooked fact that Darwin’s “cast-iron logic” led him to advocate and defend the discredited concept of Lamarckianism (the idea that “acquired characteristics” can be inherited). So much for Darwin’s self-assured, cast-iron logic. Once upon a time, it all looked so simple. Nature rewarded the fit with the carrot of survival and punished the unfit with the stick of extinction. The trouble only started when it came to defining fitness.... Thus natural selection looks after the survival and reproduction of the fittest, and the fittest are those which have the highest rate of reproduction…. [W]e are caught in a circular argument which completely begs the question of what makes evolution evolve (1978, p. 170). In the November 26, 1999 issue of Science, evolutionist David Hogg put it this way: “The point of my letter [in Science’s Compass section, July 30, 1999, 286:633—BH/BT], which perhaps was not well articulated, is that there is one hypothesis, central to evolution, that remains barely tested—that evolution proceeds through the process of survival and reproduction of the fittest” (1999, 286:1679). Micromutations do occur, but the theory that these alone can account for evolutionary change is either falsified, or else it is an unfalsifiable, hence metaphysical, theory. I suppose that nobody will deny that it is a great misfortune if an entire branch of science becomes addicted to a false theory. But this is what has happened in biology…. I believe that one day the Darwinian myth will be ranked the greatest deceit in the history of science. When this happens many people will pose the question: How did this ever happen? (1987, p. 422, emp. added). To make matters worse for Mr. Hayden, evolutionists recently have gone on record as stating that natural selection has nothing to do with human evolution. Daniel Koshland, of the University of California, Berkeley, stated: “At the present time the way in which mutation and selection (survival of the fittest) has worked over evolutionary time no longer seems to apply to Homo sapiens” (2002, 295:2215-2216, parenthetical item in orig.). If it doesn’t work to cause animals to evolve, if it doesn’t work to cause plants to evolve, and if it doesn’t work to cause humans to evolve—exactly when does natural selection work to cause anything to “evolve”? For over 100 years, evolutionists have considered a creature known as Archaeopteryx to be the best example of a transitional form between land-dwelling animals and birds. In 1860, a single refined, asymmetrical feather was discovered in the Solnhofen Limestone (named after the small city of Solnhofen, Germany). This discovery provided the ultimate gift of the evolutionary gods to scientists of the day who were searching diligently for something (anything!) in the fossil record that portrayed the combined traits of two distinct classes of animals. The animal from which the feather was alleged to have come eventually was named Archaeopteryx lithographica, a creature that must have had a considerable impact on a society that already was discussing Darwin’s intriguing proposals regarding the theory of evolution. This “missing link” was the first real evidence that Darwinists felt supported their position of a transition from land-dwelling animals into birds. For over 100 years, evolutionists have considered Archaeopteryx the transitional form that allowed land-dwelling animals finally to get off the ground. Today, practically all evolution-based science textbooks contain a breathtaking photographic reproduction, and equally fascinating description, of Archaeopteryx, with genealogical lines showing the descent of modern birds from this ancient “intermediate.” According to paleontologists, the available fossils of Archaeopteryx reveal that it was a crow-sized animal that may have been able to fly, but probably not very far. Archaeopteryx had a wingspan of about 1.5 feet, was approximately 1 foot long from beak to tail, and likely weighed around 11 to 18 ounces. However, this one “missing link”—which was supposed to revolutionize mankind’s understanding of bird evolution—ultimately created more problems than solutions for evolutionists. An ongoing debate as to whether or not this animal was merely a bird, or a true intermediate, has been continuing nonstop for over a century. The famous American dinosaur hunter Othniel C. Marsh once said: “He is certainly a wise man who today can tell a bird from a reptile, with only the fragments of an ancient form before him” (1890). Two years after German paleontologist Herman von Meyer published his description of Archaeopteryx, Sir Richard Owen, the curator of the British Museum of Natural History, published his own description. As far as Owen was concerned, Archaeopteryx was unequivocally a bird—a peculiar and distinctive bird, but a bird nevertheless. So what is it about this famous fossil that has some people seeing birds and others seeing dinosaurs? The urgency of needing to find some sort of “intermediate,” caused evolutionists to concentrate on as many features of Archaeopteryx as possible in order to discover “combined” traits. According to Niles Eldredge of the American Museum of Natural History, Archaeopteryx had “advanced characteristics of birds and retained a tremendous amount of ‘primitive’ characteristics, like teeth” (as quoted in Sunderland, 1988, p. 78). However, some fish have teeth, some do not. Some amphibians have teeth, some do not. How can a scientist look at the presence of teeth and simply assume that this animal evolved from something else? Mongolian and U.S. researchers have found a 75-million-year-old, bird-like creature with a hand so strange it has left paleontologists grasping for an explanation.... Paul Sereno of the University of Chicago notes that Mononychus had arms built much like those of digging animals. Because moles and other diggers have keeled sternums and wrists reminiscent of birds, the classification of Mononychus becomes difficult, he says (1993, 143:245). has simply become a patsy for wishful thinking. Is Archaeopteryx the ancestor of all birds? Perhaps yes, perhaps no: there is no way of answering the question. It is easy enough to make up stories of how one form gave rise to another, and to find reasons why the stages should be favoured by natural selection. But such stories are not a part of science, for there is no way of putting them to the test (as quoted in Sunderland, 1988, p. 102). The story surrounding Archaeopteryx has been complicated by another discovery that has left evolutionists scratching their heads in regard to where, exactly, the creature actually fits in the evolutionary scheme of things. In 1986, Sankar Chatterjee and colleagues at Texas Tech University discovered the fossilized remains of two crow-sized birds allegedly 75 million years older than Archaeopteryx (i.e., approximately 225 million years old according to evolutionary dating schemes) [see Beardsley, 1986; Chatterjee, 1991]. Chatterjee named the find Protoavis texensis (first bird from Texas), and has reported that the skull of Protoavis has 23 features that are fundamentally bird-like. In commenting on this, one author wrote in Science concerning Chatterjee’s work: “His reconstruction also shows a flexible neck, large brain, binocular vision, and, crucially, portals running from the rear of the skull to the eye socket—a feature seen in modern birds but not dinosaurs” (Anderson, 1991, 253:35). All of this has caused evolutionists severe problems because Protoavis appeared at the time of the earliest dinosaurs, which means that if it is accepted as genuine, then birds obviously could not have evolved from dinosaurs, and Archaeopteryx could not be the ancestor of modern birds. After looking at the evidence for Protoavis, Kansas University paleontologist Larry Martin suggested: “There’s going to be a lot of people with Archaeopteryx eggs on their face” (as quoted in Anderson, 253:35). Researchers have compared the asymmetry of some of the flight feathers of Archaeopteryx with those of modern flying and flightless birds, as well as with the Solnhofen feather (see Speakman, et al., 1994). They discovered that the average asymmetry for Archaeopteryx feathers was 1.25, which was lower than that of modern flying birds but overlapping that of modern flightless birds. The isolated feather exhibited an asymmetry of 2.2—just within the range of modern flying birds. In addition, Archaeopteryx’s claw was compared with the claws of more than 500 species of modern birds. The study found that the pes (hind foot) of the Archaeopteryx fell within the average range of perching birds, whereas the middle claws of the manus (front hand) fell within the upper range of the claws of the strongest perching birds and completely within the range of the claws of trunk climbers (Feduccia, 1993, 259:791). The authors of the study thus concluded that in all likelihood, Archaeopteryx was a perching bird. For more than a century, the approach of some evolutionists has been to find some supporting evidence, tout it as “proof ” of evolution, and then ignore conflicting theories or data. But what do the actual facts reveal about creatures such as Archaeopteryx? In reality, the story that scientists have attempted to weave in regard to this ancient “missing link” is unraveling before their very eyes. Scientific data have shown colossal differences in reptilian and bird lungs, scales as opposed to feathers, and the embryological hand development of dinosaurs versus birds. It may well be that we are witnessing the last gasps of a dying hypothesis about how birds evolved from dinosaurs! Faced with such overwhelming evidence against true evolutionary descent, it would be unrealistic to accept the position that Archaeopteryx lithographica is anything like the missing link that evolutionists once claimed it was. We know that it is impossible when confronted with a fossil, to be certain whether it is your ancestor, or the ancestor of anything else, even another fossil. We also know that adaptive scenarios are simply justifications for particular arrangements of fossils made after the fact, and which rely for their justification on authority rather than on testable hypotheses (p. 127). I conclude that Archaeopteryx was arboreal and volant [i.e., possessing extended wings for flight—BH/BT], considerably advanced aerodynamically, and probably capable of flapping, powered flight to at least some degree. Archaeopteryx...was, in the modern sense, a bird (1993, 259:792). As Hayden continued his defense of evolution, he brought to the reader’s attention a “hairy, doglike creature” that purportedly took to the sea and became the first whale. The origin of whales has dominated media headlines over the past several years as scientists have wrestled with why aquatic creatures would grow legs, walk the Earth, and then inexplicably decide to return to the water (thus explaining the differences between fish and aquatic mammals such as dolphins and whales). Daryl Domning, a paleontologist at Howard University stated: “We essentially have every stage now from a terrestrial animal to one that is fully aquatic” (Mayell, 2001). That bold declaration was made in National Geographic News on-line, October 10, 2001, after a sea cow skeleton was found in Seven Rivers, Jamaica. Evolutionists contend that this recent find, which they have labeled an entirely new genus and species, played an important role in helping terrestrial animals make the transition from land to water. In 1859, Darwin suggested that whales arose from bears, sketching a scenario in which selective pressures might cause bears to evolve into whales. But, embarrassed by criticism, he removed his hypothetical swimming bears from later editions of the Origin of Species (see Gould, 1995, p. 359). Evolutionists were unsure how to proceed, since they knew that whales were different from fish; thus, a different evolutionary account was required. Whales are warm-blooded vertebrates that regulate their internal temperature via heat generated by a high metabolism. Like most mammals (the exception being the duck-billed platypus), female whales bear live young, which are nursed by mammary glands. While adult whales are not covered in hair or fur, they do acquire body hair temporarily as fetuses. These features make whales unequivocally mammalian—a fact that poses a mountainous hurdle for evolutionists. The November 2001 issue of National Geographic capitalized on recent propaganda in an article titled “Evolution of Whales.” While the official scientific names and full-color reconstructions contained in the article appear quite impressive, the data are far from it. A closer examination of two alleged whale predecessors—Pakicetus and Ambulocetus—reveals that these creatures had little in common with whales, and thus do not represent the animals’ ancient ancestors. What causes scientists to declare the creature a whale? Subtle clues in combination—the arrangement of cups on the molar teeth, a folding in a bone of the middle ear, and the positioning of the ear bones within the skull—are absent in other land animals but a signature of later Eocene whales (2001, 200:68). So, from mere dimples in teeth and folded ear bones, this animal somehow “qualifies” as a walking whale? Interestingly, prominent whale expert J.G.M. Thewissen and his colleagues later unearthed additional bones of Pakicetus (Thewissen, et al., 2001). The skeletons of Pakicetus published by Thewissen et al. do not look anything like the swimming creature featured in either Gingerich’s original article or in National Geographic. In fact, in a commentary in the same issue of Nature in which the article by Thewissen et al. was published, the following statement appeared: “All the postcranial bones indicate that pakicetids were land mammals, and…indicate that the animals were runners, with only their feet touching the ground” (see De Muizon, 2001, 413:260). National Geographic, however, deceptively chose to display the Pakicetus in a swimming position, obviously trying to sway the reader into believing that Gingerich’s fossilized jawbone and skull fragments represented some type of aquatic creature—which they do not. The next alleged ancestor, Ambulocetus natans, was proposed as a whale long before the dust settled from its fossilized remains. The name itself, “Ambulocetus natans,” comes from the Latin words “ambulare” (to walk), “cetus” (whale), and “natans” (swimming), meaning quite literally a walking, swimming whale. The scientists who discovered and subsequently named this fossil screamed “walking whale” well in advance of a complete analysis, and the illustrator for National Geographic exercised a vast amount of “artistic license” in assigning webbed feet to the creature. While such feet definitely make the creature look more aquatic, it is impossible to come to any such conclusion from a study of the fossils themselves. Soft tissues (such as webbed feet) normally do not fossilize well. There is no evidence this creature ever spent any amount of time in the water—yet the drawing shows an animal with rear legs that appear to be built for an aquatic environment. An examination of the actual skeleton (see Carroll, 1998, p. 335) quickly dispels the notion that the rear legs performed as obligatory fins. The legs on Ambulocetus were not fins at all, but rather legs made for walking and supporting weight. It is quite entertaining, starting with cows, pigs, or buffaloes, to attempt to visualize what the intermediates may have looked like. Starting with a cow, one could even imagine one line of descent which prematurely became extinct, due to what might be called an “udder failure” (1995, p. 198). In his U.S. News & World Report article, Thomas Hayden correctly noted that Darwin held that new species evolve slowly, “the result of countless small changes over many generations” (p. 44). Hayden also correctly noted, however, that “many creatures still appear quite suddenly in the fossil record.” He went on to admit that the first animals appearing in the fossil record are “complex animals, including worms, mollusks, and shrimplike arthropods” that “show up some 545 million years ago.” “Paleontologists,” Hayden continued, “have searched far and wide for fossil evidence of gradual progress toward these advanced creatures but have come up empty” (pp. 44-45). He then quoted paleontologist Whitey Hagadorn of Amherst College, who sheepishly confessed: “Paleontologists have the best eyes in the world. If we can’t find the fossils, sometimes you have to think that they just weren’t there” (p. 45). This regular absence of transitional forms is not confined to mammals, but is an almost universal phenomenon, as has long been noted by paleontologists. It is true of almost all orders of all classes of animals, both vertebrate and invertebrate. A fortiori, it is also true of the classes, and of the major animal phyla, and it is apparently also true of analogous categories of plants (1944, p. 105, emp. added). Possibility for such dispute exists because transitions between major grades of organization are seldom well recorded by fossils. There is in this respect a tendency toward systematic deficiency in the record of the history of life. It is thus possible to claim that such transitions are not recorded because they did not exist… (1949, p. 231, emp. added). Creationists—adhering to the concept that scientific theories should be based upon the actual presence of evidence, rather than on the absence of evidence—have long taken exactly such a stance: transitional forms are not recorded because they did not exist! ...continuous transitional sequences are not merely rare, but are virtually absent. ...their absence is so nearly universal that it cannot, offhand, be imputed entirely to chance, and does require some attempt at special explanation, as has long been felt by most paleontologists (p. 105, emp. added). It is thus possible to claim that such transitions are not recorded because they did not exist, that the changes were not by transition but by sudden leaps in evolution. There is much diversity of opinion as to just how such leaps are supposed to happen (p. 231, emp. added). As a Darwinian, I wish to defend Goldschmidt’s postulate that macroevolution is not simply microevolution extrapolated and that major structural transitions can occur rapidly without a smooth series of intermediate stages.... I do, however, predict that during the next decade Goldschmidt will be largely vindicated in the world of evolutionary biology (1977, 86:24,22). Little did anyone understand at the time that Goldschmidt’s “vindication” was being prophesied by the very man who would work for more than three decades to vindicate him. Dr. Gould himself spoke eloquently of the fact that “most species exhibit no directional change during their tenure on earth. They appear in the fossil record looking much the same as when they disappear; morphological change is usually limited and directionless.” Gould likewise admitted: “In any local area, a species does not arise gradually by the steady transformation of its ancestors; it appears all at once and ‘fully formed’ ” (1980, p. 182). Derek Ager, past-president of the British Geological Association, gave his own description of how he viewed the geological history of the Earth: “In other words, the history of any one part of the earth, like the life of a soldier, consists of long periods of boredom and short periods of terror” (1973, p. 100). Another theorist [he was referring to Goldschmidt—BH/BT] proposes that the marvelous gifts of evolution to the living world came to birth through sudden and drastic “systemic mutations,” which created “hopeful monsters” that were later polished down to the final product by evolutionary selection. But these theories amount only to giving more or less fancy names to imaginary phenomena; no one has ever observed the occurrence of a “systemic mutation” for instance (1957, p. 131). How, then, does U.S. News & World Report’s Hayden propose that these marvelous “leaps” in evolutionary progression occurred? In a word—catastrophes. In his view, “enormous volcanic eruptions that belched carbon dioxide, creating a super greenhouse effect [and] severe cold spells that left much of the planet in ice,” plus “collisions with asteroids,” were responsible for the rich variety of organisms we see around us today. But why would such catastrophes cause organisms to “evolve rapidly”? Hayden suggested that “these convulsions killed off much of life’s diversity.” And that would help organisms speedily change from one kind to another by…? Harvard paleontologist Andy Knoll, whom Hayden quoted, offered the following scenario. He proposed that once conditions on Earth improved, “the survivors found a world of new opportunities. They were freed to fill new roles, ‘experimenting’ with new body plans and evolving too rapidly to leave a record in the fossils” (p. 45). Is this not absolutely “magical”? We are led to believe that volcanoes and asteroids are responsible for some animals having wings, and others having dozens of legs—all because there were “new opportunities.” Has this been documented today following volcanic eruptions? No. And the specific genetic mechanism for such “miraculous” transformations would be…? Furthermore, consider this: How would evolutionists account for the sudden explosion of life in the fossil record in the first place? Did an “early catastrophe” somehow create life and endow it with its marvelous variety of spectacular features—instantaneously and simultaneously?! All of the animal phyla are represented in the Cambrian period except two minor soft-bodied phyla (which may have been present without leaving any fossil evidence), and the chordates. Even the chordates may have been present, since an object which looks like a fish has been discovered in Cambrian rock. It is hardly conceivable that all these forms should have originated in this period; and yet there is no evidence for the existence of many of them prior to the Cambrian period (1972, pp. 193-194). Even theoretically, to make the vast biological leap from primitive organisms to the Cambrian fauna poses enormous problems. A remarkable series of transformations is required to change a single-celled protozoan into a complex animal such as a lobster, crab, or shrimp. The new life-forms appearing in the Cambrian were not simply a cluster of similar cells; they were complex, fully formed animals with many specialized types of cells.... The new Cambrian animals represented an astonishing leap to a higher level of specialization, organization, and integration (American Scientific Affiliation, 1986, pp. 35, 37). We are being asked by evolutionists to believe that from such “ancestors” as those found in the Ediacaran complex, all of the major animal phyla “evolved” in the time period represented by a jump between the Precambrian and the Cambrian periods. Such is not only impossible, but also unreasonable. Before the Cambrian period, almost all life was microscopic, except for some enigmatic soft-bodied organisms. At the start of the Cambrian, about 544 million years ago, animals burst forth in a rash of evolutionary activity never since equaled. Ocean creatures acquired the ability to grow hard shells, and a broad range of new body plans emerged within the geologically short span of 10 million years. Paleontologists have proposed many theories to explain this revolution but have agreed on none (1997, 152:52). If any event in life’s history resembles man’s creation myths, it is this sudden diversification of marine life when multicellular organisms took over as the dominant actors in ecology and evolution. Baffling (and embarrassing) to Darwin, this event still dazzles us and stands as a major biological revolution on a par with the invention of self-replication and the origin of the eukaryotic cell. The animal phyla emerged out of the Precambrian mists with most of the attributes of their modern descendants (1990, 345:765, parenthetical item in orig.). The Cambrian strata of rocks, vintage about 600 million years [evolutionists are now dating the beginning of the Cambrian at about 530 million years], are the oldest in which we find most of the major invertebrate groups. And we find many of them already in an advanced state of evolution, the very first time they appear. It is as though they were just planted there, without any evolutionary history. Needless to say, this appearance of sudden planting has delighted creationists (1986, p. 229, bracketed comment in orig.). All of the basic architectures of animals were apparently established by the close of the Cambrian explosion; subsequent evolutionary changes, even those that allowed animals to move out of the sea onto land, involved only modifications of those basic body plans. About 37 distinct body architectures are recognized among present-day animals and from the basis of the taxonomic classification level of phyla.... Clearly many difficult questions remain about the early radiation of animals. Why did no many unusual morphologies appear when they did, and not earlier or later? The trigger of the Cambrian explosion is still uncertain, although ideas abound (1997, 85:126,127). As Gould observed: “Even the most cautious opinion holds that 500 million subsequent years of opportunity have not expanded the Cambrian range, achieved in just five million years. The Cambrian explosion was the most remarkable and puzzling event in the history of life” (1994, 271:86, emp. added). Or, as Andy Knoll noted earlier: “We now know that the Ediacaran radiation was indeed abrupt and that the geologic floor to the animal fossil record is both real and sharp” (1991, 265:64). This explosion of life that is found in the fossil record all over the world is a serious stumbling block for evolutionists, while for creationists it makes logical sense—God created all living things during the Creation week. Once again, it is creationists who have built a logical scientific theory on the actual evidence (the sudden appearance of fully formed, completely functional, well-designed organisms), while evolutionists have been forced to invent theory after theory due to a complete lack of evidence. Thomas Hayden then matter-of-factly proposed that “we may owe our dominance to the asteroid impact that killed the dinosaurs 65 million years ago” (p. 45). According to this theory, which was set forth in the early 1980s by the famed Nobel laureate Luis Alvarez and his son Walter, a large meteor (6 miles in diameter) hit the Earth 65 million years ago at end of Cretaceous period (see Hoffman, 1982; Discover, 1984, pp. 21ff. ; Alvarez and Asaro, 1990). At time of impact, the object was estimated to be traveling 50 times faster than the fastest known jet aircraft. The result was the release of vast amounts of energy, causing worldwide firestorms, tsunamis, tidal waves, etc. Great clouds of dust (from the impact), mixed with soot and ash (from the firestorms), rose into the upper atmosphere and were dispersed around the globe via the jet stream. As a result, sunlight was blocked, causing plants to be unable to grow and food chains to collapse. Dinosaurs thus became extinct. Clay layers at the so-called Cretaceous-Tertiary boundary (found in such places as Italy, Denmark, New Zealand, and elsewhere) are said to contain an unusual amount (30 times higher than surrounding rocks) of an element known as iridium (a heavy metallic chemical element), which is known to exist in higher concentrations in extraterrestrial objects (like asteroids) than on Earth. Thus, so the theory goes, there is compelling evidence that an asteroid was the cause of the dinosaurs’ extinction. However, there are alternative explanations. First, iridium may have resulted from volcanic processes. Igneous rocks include traces of iridium, especially when derived from the deep mantle. Second, the Deccan Traps region of India experienced massive volcanism at the same time as the alleged extinction of the dinosaurs, resulting in basaltic lava (containing iridium) that covered over 180,000 square miles. Third, evolutionists’ own fossil record does not substantiate an instantaneous demise of the dinosaurs. Some allegedly died out within the Cretaceous period, while others apparently survived well into the Tertiary period (millions of years later, according to evolutionary dating methods). Fourth, why did the impact kill off dinosaurs, while many other forms of life remained healthy and alive? Some of the least mobile creatures (tortoises, crocodiles, etc.) survived, as did vast numbers of plants, according to the fossil record. Fifth, in the fossil-rich state of Montana, the iridium layer is found two-three inches above the highest dinosaur remains, which suggests that the dinosaurs actually disappeared before any impact event (see DeYoung, 2000, pp. 26-30). New studies suggest that dramatic climate changes were killing off behemoths even before the asteroid impact. Long before the asteroid impact, the diversity of plants at the Hell Creek Formation [in eastern Montana!—BH/BT] was dwindling. Conifers and ferns dominated the environment. Vegetation was patchy and thin. Dinosaurs and their prey would have had to scramble to survive (23:36-37, emp. added). To suggest, as Thomas Hayden did, that the asteroid theory is responsible for the complexity of life on Earth, is indefensible. Maybe he could explain exactly how dinosaurs all over the planet were selectively wiped out by this asteroid, while other animals survived. According to standard evolutionary theory, no advanced mammals were present in the “age of the dinosaurs.” The dinosaurs, it is suggested, became extinct in the Cretaceous Period, and the only mammals that had evolved at that point (even at the very end of the period) were small, mostly about mouse-sized, and rare (1957, p. 797, parenthetical item in orig.). During preparation of the specimen a patch of small bones was revealed within the ribcage, on the ventral sides of the posterior left thoracic ribs and vertebrae, where the stomach is positioned in extant mammals. Unduplicated dentition [teeth—BH], limb bones and phalanges [bones of the toes or “fingers”—BH] in the patch confirm that these bones belong to a juvenile individual of Psittacosaurus, an herbivorous dinosaur that is common in Jehol Biota. The serrated teeth in the patched skeleton are typical of juvenile Psittacosaurus. The skull and most of the skeleton of the juvenile Psittacosaurus are broken, disarticulated and displaced, in contrast to the preservation of the R. robustus skeleton, which is essentially in its original anatomical relation. Although fragmentary, the bones of the Psittacosaurus are packed in a restricted area. These conditions indicate that the juvenile skeleton of Psittacosaurus is the remaining stomach contents of the mammal (Hu, et al., 2005, 433:151). Mr. Hayden would be well advised to research his subject matter better before he sets out to defend timeworn, threadbare, outdated scientific theories. In trying to explain the diversity of life on Earth, Mr. Hayden resorted to the latest crutch supporting the decrepit evolutionary theory—Homeobox (a.k.a. “Hox”) genes. Evolutionists portray these “master genes”—which are depicted as self-reliant, relatively simple entities that can produce major mutations—as the mechanism for changing one species into another. Thus, Hox genes are used to explain the vast differences in species we see today. Scientific literature on homeobox genes spans the spectrum from reporting experimental results to pure propaganda and scandalous speculation. Much of this speculation can be attributed to the fact that although most vertebrates and arthropods “have strikingly different body architectures, many of the regulatory genes they use to establish their body plan are conserved” (Kmita-Cunisse, et al., 1998, 95:3030). In other words, the same homeobox genes are believed to be responsible for different attributes in vastly divergent species. Evolutionary scientists, however, have drawn conclusions regarding a common origin, with little regard to the actual empirical evidence. These inferences have led to the belief that one animal can experience a developmental cascade common to all animals. But these genes are not simply passive providers of encoded instructions responsible for development. Simply put, Hox genes are pieces of DNA that either promote or inhibit other genes, which, in turn, play a role in the development of an organism. In the fruit fly, for example, one Hox gene promotes wing development. And so, during the early stages of the fly’s development, this gene signals the manufacture of wing structures. Scientists have been able to use this information to produce flies without wings, or even flies with two sets of wings. But producing a two-winged fly, or adding a pair of legs to the head of an animal, is a far cry from explaining how microorganisms, plants, and animals all descended from a nonliving source. William Bateson, who coined the term “homeosis” in 1894, “felt that he could further strengthen Darwin’s case by exhaustively compiling the discontinuous variations that occur naturally within a species” (Lewis, 1994, 10:341, emp. added). Thus, evolutionists were quick to point out that homeobox genes play a significant role in the evolutionary origin of body plans (Lewis, 1994; Raff, 1996; Gellon and McGinnis, 1998). Some evolutionists have taken this a step farther and proclaimed that Hox genes are the agents responsible for saltation (the “sudden leap” that Goldschmidt, Simpson, and Could postulated), resulting in a new species or a higher taxon in what is essentially a single evolutionary step due to a major mutation or other “unknown cause.” Paleoanthropologist Jeffrey Schwartz has advocated the view that the role of homeobox genes in individual development is a far better explanation of the origin of new species than any other mechanism. He even has suggested: “…[A]ll that is necessary is that homeobox genes are either turned on or they are not” (1999, pp. 362). Can scientists manipulate these genes to grow antennae, wings, or legs in places where they normally would not grow? Yes, they can. But does this manipulation “prove” or support evolution? No, it does not. Hox genes play key roles in regulating body plans. Hox genes do not produce “new” material. Mutating an animal to add a second pair of wings is not the same thing as creating, from scratch, a new gene for wing production. Creationist David A. DeWitt of Liberty University emphasized the point that despite evolutionists’ dependence upon mutations, “the fact that scientists can significantly alter the body plan does not prove macro-evolution, nor does it refute creation. Successful macro-evolution requires the addition of new information and new genes that produce new proteins that are found in new organs and systems” (2002, emp. in orig.). DeWitt has emphasized a crucial point: scientists have not produced anything “new.” And that is exactly our point! How can one claim that Hox genes provide the answers to so many different species, when the evidence demonstrates that entirely new organisms are not being formed? Hox genes do not act in a biological vacuum. They rely on numerous other genes and proteins to carry out their tasks. For instance, a light switch is great for turning on a light—but only if you have the necessary wires and bulb in place “downstream.” Without those, the switch is nothing more than, well, a useless switch. Hox genes, like light switches, rely on certain postcursors (other genes already present in an organism). Hox genes cannot do everything “by themselves.” Keep in mind there is a well-balanced feedback mechanism in place inside every living cell. If more proteins are needed, genes are “turned on” so that those proteins can be produced. When genes mutate, this delicate balance of proteins is affected adversely, causing the production of either too many or too few of these proteins. This is rarely a good thing. Hox genes are not the first active genes in the developing embryo. As genetic researcher Jason Robert pointed out in the journal Evolution & Development, the mesoderm (the embryonic germ layer that gives rise to muscles, connective tissues, the vascular system, and certain organs) is genetically induced at the cleavage stage, long before Hox genes become active (2001, 3:290). Thus, Hox genes are not the initial determinant of what an organism will become. Mutated genes would result in a need for new and different proteins. For instance, if a non-flying insect (theoretically) could be altered so that it developed wings, then proteins would have to be present to assist in the manufacture of those wings. Those proteins also must have “chaperone” proteins that assist them in their multiple tasks. How likely is it that the altered Hox gene, and all of these other cellular components, would evolve at exactly the same time? We also must keep in mind that all of this is occurring in a three-dimensional environment that is dependent on proteins being able to recognize and interact with other proteins. Otherwise, the entire complex is completely useless. While a Hox gene may be able to alter the development of a particular structure, that does not mean necessarily that all of the items necessary for that structure will be present in the newly mutated animal. For instance wings, legs, or eyes may be transplanted to various regions of the body. But experiments have shown that the muscles and nerves necessary for those structures to function normally are not routinely manufactured. So while a non-flying animal might possess a mutated Hox gene that normally would control wing production, the other genes necessary to make the wings function would not necessarily be present—thereby making this “new” addition useless. When particular genes are turned on for certain lengths of time and in certain regions, a worm may emerge. If the same or other genes are expressed for different lengths of time and in different regions, a more complex organism may develop (1999, p. 352). This implies that if a gene were “left on” for a while longer, then a worm might become a frog or lizard. And yet there is no evidence whatsoever for such an outlandish claim. Worms produce worms, not lizards or frogs. While scientists may be able to induce into species “Y” a structure (e.g., limbs) that normally is specific for species “X,” that still is a long way from Xs giving birth to Ys merely as a result of manipulating Hox genes! After departing the realm of genetics, Thomas Hayden entered the field of microbiology as proof for evolution, and introduced Richard Lenski, a microbiologist who has been following twelve populations of the bacterium Escherichia coli since 1988. At one point, the populations were genetically identical, but, as Hayden reported, “each has adapted in its own way to the conditions in its test-tube home” (p. 48). By endowing such bacteria with a “sinister mind,” Harvard evolutionary biologist Stephen Palumbi suggested that “bacterial evolution outwits one antibiotic after another” (p. 48). We are all familiar with the concept—microorganisms that change over time, appearing to perceive and then thwart our most impressive medical efforts to kill them. But do they do it “on purpose”? Humanity seemed to have won the battle against many diseases and viruses by using various drug treatments in the 1960s and 1970s. Today, however, it appears instead that we may have inadvertently toughened the battle. According to evolutionist Kenneth Miller, “the culprit is evolution” (1999, p. 50). Evolutionists frequently use this idea of the “rapid evolution” of microorganisms as “observed proof ” for evolution. Their claim is that drug-resistant strains of many types of such organisms have evolved from strains that, at one time, were susceptible to these same drug treatments. Scientists would have us believe that microorganisms are “selectively” adapting to our drug treatments through a mechanism that involves genetic mutations. However, studies indicate an alternative explanation for this acquired immunity—one that argues against organic evolution. Researchers Monica Sala and Simon Wain-Hobson (of the world-famous Pasteur Institute in France) published a paper titled “Are RNA Viruses Adapting or Merely Changing” (2000). In this particular study, they examined 85 sets of proteins from viruses that are known to infect bacteria, plants, and mammals. According to the old evolutionary hypothesis, once drug therapy alleviates the majority of susceptible microorganisms, only those that remain have mutated during replication and thus are resistant. Evolutionists believe that this represents a type of natural selection taking place, in which mutations “purposefully” confer drug resistance. Speaking about bacterial replication, Miller stated: “The result is unavoidable, given the millions of genetic duplications that occur in a bacterial population in just a few days. Sooner or later, the ‘right’ mutation shows up, and it causes the individual bacteria that possess it to prosper at our expense” (p. 50). That some germs were already resistant to man-made antibiotics before these were invented is common knowledge to microbiologists. Soil samples from villages where modern antibiotics had never been used show that some of the germs are already resistant to drugs like methicillin which have never existed in nature (1997/1998, 20:11). Additionally, in 1988, researchers did autopsies on three of the Northwest Passage explorers who froze to death in the Arctic in 1845. Bacteria from their colons were cultured (with great care, to avoid any possible contamination), and many already were resistant to the most powerful modern-day antibiotics (see Wieland, 1994; McGuire, 1998). Furthermore, microorganisms like bacteria do not become resistant to antibiotics merely by experiencing genetic mutations. In fact, there are at least three known genetic mechanisms by which such resistance can be conferred. First, there are instances where mutations produce antibiotic-resistant strains of microorganisms. Second, there is the process of conjugation, which among bacteria is analogous to copulation in humans. During conjugation, two bacterial cells join, and an exchange of genetic material occurs. Inside many bacteria there is a somewhat circular piece of self-replicating, extra-nuclear DNA known as a plasmid, which codes for enzymes necessary for the bacteria’s viability. Certain of these enzymes, coincidentally, are able to catalyze the breakdown of antibiotics, thus conferring upon the bacteria resistance to antibiotics. During conjugation, plasmids in one organism that are responsible for resistance to antibiotics can be transferred to an organism that previously did not have such resistance. Third, bacteria can incorporate into their own genetic machinery short, foreign pieces of DNA through either two types of DNA transposition—transformation or transduction. In transformation, a piece of DNA from the surrounding environment (perhaps left there when another bacterium died) is absorbed into the bacterial cell. In transduction, a foreign piece of DNA is transported physically into the cell via a virus. As a result of incorporating new genetic material, an organism can become resistant to antibiotics when heretofore it was not. ...the adaptive “needs” of the species do not increase the likelihood that an adaptive mutation will occur; mutations are not directed toward the adaptive needs of the moment.... Mutations have causes, but the species’ need to adapt isn’t one of them (1983, pp. 137,138). What does this mean? Simply put, bacteria did not “mutate” as a result of being exposed to antibiotics; the mutations responsible for the resistance were present in the bacterial population even prior to the discovery or use of the antibiotics. Joshua Lederberg’s experiments on streptomycin-resistant bacteria in 1952 showed that bacteria which never had been exposed to the antibiotic already possessed the mutations that conferred the resistance (see Lederberg and Lederberg, 1952). Second, while certain pre-existing mutations may confer to bacteria antibiotic resistance, such mutations also may decrease the organism’s viability in other ways. For example, “the surviving strains are usually less virulent, and have a reduced metabolism and so grow more slowly. This is hardly a recommendation for ‘improving the species by competition’ (i.e., survival of the fittest)” [Bowden, 1991, p. 56, parenthetical item in orig.]. Just because a mutation provides an organism with a certain trait does not mean necessarily that the organism as a whole has been helped. For example, people afflicted with the mutant gene for sickle-cell anemia are “carriers” of the disease but do not die from it. Such people are inexplicably resistant to malaria, which at first would seem to be an excellent example of a good mutation. However, that is not the entire story. While it is true that these people are resistant to malaria, it is also true that they are not as healthy, do not possess the stamina, and do not live as long as their unafflicted counterparts. Bacteria may be resistant to a certain antibiotic, but that resistance comes at a price (e.g., reduced metabolism, slower growth, etc.). From an evolutionary point of view, in the grand scheme of things this is harmful, not beneficial. Third, regardless of how bacteria acquired their antibiotic resistance (i.e., by mutation, conjugation, or by transposition), the fact remains that they still are exactly the same bacteria after receiving that trait as they were before receiving it. This “proof ” of evolution turns out to be not vertical macroevolution but horizontal microevolution (i.e., adaptation). In other words, these bacteria “...are still the same bacteria and of the same type, being only a variety that differs from the normal in its resistance to the antibiotic. No new ‘species’ have been produced” (Bowden, p. 56). In commenting on the changing, or sharing, of genetic material, ReMine has suggested: “It has not allowed bacteria to arbitrarily swap major innovations such as the use of chlorophyll or flagella. The major features of microorganisms fall into well-defined groups that seem to have a nested pattern like the rest of life” (1993, p. 404). Bacteria, the study of which has formed a great part of the foundation of genetics and molecular biology, are the organisms which, because of their huge numbers, produce the most mutants…. [B]acteria, despite their great production of intraspecific varieties, exhibit a great fidelity to their species. The bacillus Escherichia coli, whose mutants have been studied very carefully, is the best example. The reader will agree that it is surprising, to say the least, to want to prove evolution and to discover its mechanisms and then to choose as a material for this study a being which practically stabilized a billion years ago (1977, p. 87). [I]t’s the idea that human beings themselves are products of evolution that provokes most of the attacks on evolution. Such rejections leave most scientists mystified. “The scientific narrative of the history of life is as exciting and imbued with mystery as any other telling of that story,” says Knoll. The evidence against evolution amounts to little more than “I can’t imagine it,” Ewald adds. “That’s not evidence. That’s just giving up.” (p. 50). Give up? Hardly! Mr. Hayden has thrown down the gauntlet. And we will not hesitate to pick it up! He has drawn the line in the sand. And we will not hesitate to cross it. First, the “evidence against evolution” scarcely amounts to “little more than ‘I can’t imagine it,’ ” as this review has amply documented. Anyone willing to take the time to investigate with an open mind, soon will be impressed with the mountains of evidence against evolution. Books such as Jonathan Sarfati’s Refuting Evolution (1999), or Scott Huse’s The Collapse of Evolution (1997), provide compelling evidence against the theory. Second, evolutionists constantly complain that creationists are unable to support their own case with scientific evidence. Instead, all creationists can do is attack the evolutionist’s case with “negative evidence.” “Why don’t creationists have any scientific evidence to support their case?,” goes the old refrain? Evolutionists who ought to know better carelessly parrot this tired old argument. In multiple debates with evolutionists, creation scientists have affirmed piece after piece of positive evidence for the creation model. Pieces of evidence from the various fields of science are piled one on top of the other to make the strongest possible case for creation. In fact, entire books have been written on the subject (see, for example, Morris and Parker, 1987; Thompson, 2002). Creationists continually point out to evolutionists that the law of biogenesis states explicitly that life comes only from life of its kind, and that this law is the cornerstone of all biology. Creationists continually point out that the fossil record is replete with gaps, and is devoid of the transitional forms that evolution must have if it is to preserve its case. Creationists continually point out that genetic mutations reduce viability, rather than changing one species into another. Creationists continually point out that the laws of thermodynamics clearly indicate that the Universe: (a) could not have created itself; and (b) is running down and becoming less ordered, not building up and becoming more ordered. Creationists continually point out that the Universe is contingent, and that contingent entities ultimately are dependent upon a non-contingent entity—a concept that fits the creation model perfectly, but that is something the evolution model cannot begin to explain. And so on. Adler, Jerry (1980), “Is Man a Subtle Accident?,” Newsweek, 96:95, November 3. Ager, Derek (1973), The Nature of the Stratigraphical Record (New York: John Wiley & Sons). Alvarez, Walter and Frank Asaro (1990), “An Extraterrestrial Impact,” Scientific American, 263:78-84, October. American Scientific Affiliation (1986), Teaching Science in a Climate of Controversy (Ipswich, MA: American Scientific Affiliation). 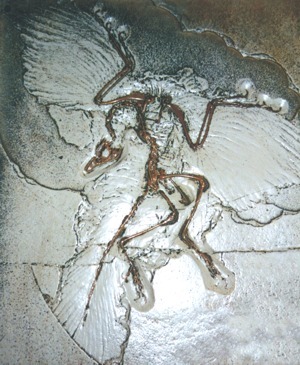 Anderson, Alan (1991), “Early Bird Threatens Archaeopteryx’s Perch,” Science, 253:35, July 5. Beardsley, Tim (1986), “Fossil Bird Shakes Evolutionary Hypothesis,” Nature, 322:677, August 21. Bengtson, Stefan (1990), “The Solution to a Jigsaw Puzzle,” Nature, 345:765-766, June 28. Carroll, Robert L. (1998), Patterns and Process of Vertebrate Evolution (New York: Cambridge University Press). Chadwick, Douglas H. (2001), “Evolution of Whales,” National Geographic, 200:64-77, November. Chatterjee, Sankar (1991), “Cranial Anatomy and Relationships of a New Triassic Bird from Texas,” Philosophical Transactions of the Royal Society of London (biology), 332:277-346. Clarke, Tom (2002), “Polio Made from Scratch,” Nature, [On-line], URL: http://www.nature.com/nsu/020708/020708-17.html. Crick, Francis (1981), Life Itself: Its Origin and Nature (New York: Simon & Schuster). de Muizon, Christian (2001), “Walking With Whales,” Nature, 413:259-260, September 20.
de Vries, Hugo (1905), Species and Varieties: Their Origin by Mutation, ed. Daniel Trembly MacDougal (Chicago, IL: Open Court). DeWitt, David A. (2002), “Hox Hype,” [On-line], URL: http://www.answersingenesis.org/docs2002/0215hox_hype.asp. Dobb, Edwin (2002), “What Wiped Out the Dinosaurs?,” Discover, 23:36-43, June. Dobzhansky, Theodosius (1957), in Plant Life, ed. Dennis Flannagan (New York: Simon & Schuster). Douglas, Erwin, James W. Valentine, and David Jablonski (1997), “The Origin of Animal Body Plans,” American Scientist, 85:126-137, March/April. Feduccia, Allan (1993), “Evidence from Claw Geometry Indicating Arboreal Habits of Archaeopteryx,” Science, 259:790-793, February 5. Futuyma, Douglas J. (1983), Science on Trial (New York: Pantheon). Gee, Henry (1999), In Search of Deep Time (New York: Free Press). Gellon, G., and W. McGinnis (1998), “Shaping Animal Body Plans in Development and Evolution by Modulation of Hox Expression Patterns,” BioEssays, 20:116-125. Gingerich, Philip D. (1994), “The Whales of Tethys,” Natural History, 103:86-88, April. Gingerich, Philip D., Munir ul Haq, et al., (2001), “Origin of Whales from Early Artiodactyls Hands and Feet of Eocene Protocetidae from Pakistan,” Science, 293:2239-2242, September 21. Gould, Stephen Jay (1977), “The Return of Hopeful Monsters,” Natural History, 86:22-30, June-July. Gould, S.J. (1980), The Panda’s Thumb (New York: W.W. Norton). Gould, Stephen J. (1994), “The Evolution of Life on Earth,” Scientific American, 271:85-91, October. Gould, Stephen Jay (1995), “Hooking Leviathan by its Past,” Dinosaur in a Haystack (New York: Harmony Books), pp. 359-376. Gould, Stephen Jay and Niles Eldredge (1977), “Punctuated Equilibria: The Tempo and Mode of Evolution Reconsidered,” Paleobiology, 3:115-151, Spring. Harrub, Brad and Bert Thompson (2001), “Archaeopteryx, Archaeoraptor, and the ‘Dinosaurs-to-Birds’ Theory” [Parts I&II], Reason & Revelation, 21:25-31,33-39, April and May. Hayden, Thomas (2002), “A Theory Evolves,” U.S. News & World Report, 133:42-50, July 29. Hoffman, Paul (1982), “Asteroid on Trial,” Science Digest, 90:58-63, June. Hogg, David W. (1999), “A Barely Tested Hypothesis,” Science, 286:1679, November 26. Hoyle, Fred (1981), “The Big Bang in Astronomy,” New Scientist, 92:527, November 19. Hu, Yaoming, Jin Meng, Yuanqing Wang, and Chuankui Li (2005), “Large Mesozoic Mammals Fed on Young Dinosaurs,” Nature, 433:149-152, January 13. Kerkut, George A. (1960), The Implications of Evolution, (London: Pergamon). Klotz, John (1972), Genes, Genesis and Evolution (St. Louis, MO: Concordia). Kmita-Cunisse, M., F. Loosli, J. Bièrne, and W.J. Gehring (1998), “Homeobox Genes in the Ribbonworm Lineus sanguineus: Evolutionary Implications,” Proceedings of the National Academy of Sciences, U.S.A., 95:3030-3035. Knoll, Andy H. (1991), “End of the Proterozoic Eon,” Scientific American, 265:64-73, October. Koestler, Arthur (1978), Janus: A Summing Up (New York: Vintage Books). Koshland, Daniel E. (2002), “The Seven Pillars of Life,” Science, 295:2215-2216, March 22. Lahav, Noam (1999), Biogenesis: Theories of Life’s Origins (Oxford, England: Oxford University Press). Lederberg, J. and E.M. Lederberg (1952), “Replica Plating and Indirect Selection of Bacterial Mutants,” Journal of Bacteriology, 63:399-406. Lewis, Edward B. (1994), “Homeosis: The First 100 Years,” Trends in Genetics, 10:341-343. Lipson, H.S. (1988), “A Physicist's View of Darwin’s Theory,” Evolution Trends in Plants, 2:6. Løvtrup, Søren (1987), Darwinism: The Refutation of a Myth (London: Croom and Helm). Marsh, Othniel C. (1890), New York Herald, January 19. Martin, Anthony R. (1990), Whales and Dolphins (London: Bedford Editions). McGuire, R. (1998), “Eerie: Human Arctic Fossils Yield Resistant Bacteria,” Medical Tribune, pp. 1,23, December 29. Monastersky, Richard (1993), “A Clawed Wonder Unearthed in Mongolia,” Science News, 143:245, April, 17. Monastersky, Richard (1997), “When Earth Tipped, Life Went Wild,” Science News, 152:52, July 26. Morell, Virginia (1993), “Archaeopteryx: Early Bird Catches a Can of Worms,” Science, 259:764-765, February 5. Morris, Henry M. and Gary E. Parker (1987), What Is Creation Science? (El Cajon, CA: Master Books). Patterson, Colin (1999), Evolution (Ithaca, NY: Cornell University Press), second edition. Pollack, Andrew (2002), “Scientists Creative a Live Polio Virus,” The New York Times, [On-line], URL: http://www.nytimes.com/2002/07/12/science/12POLI.html. Raff, R.A. (1996), The Shape of Life: Genes, Development, and the Evolution of Animal Form (Chicago, IL: University of Chicago Press). Repetski, John E. (1978), “A Fish from the Upper Cambrian of North America,” Science, 200:529-531, May 5. Ribeiro, Ruy M. and Sebastian Bonhoeffer (2000), “Production of Resistant HIV Mutants During Antiretroviral Therapy,” Proceedings of the National Academy of Sciences, U.S.A., 97:7681-86. Robert, Jason Scott (2001), “Interpreting the Homeobox: Metaphors of Gene Action and Activation in Development and Evolution,” Evolution & Development, 3:289-295. Sarfati, Jonathan (1999), Refuting Evolution (Green Forest, AR: Master Books). Schwartz, Jeffrey H. (1999), Sudden Origins (New York: John Wiley & Sons). Scott, Andrew (1985), “Update on Genesis,” New Scientist, 106:30-33, May 2. Simpson, George Gaylord (1944), Tempo and Mode in Evolution (New York: Columbia University Press). Simpson, George Gaylord (1949), The Meaning of Evolution (New Haven, CT: Yale University Press). Simpson, George Gaylord, Simpson, C.S. Pittendrigh, & L.H. Tiffany, (1957), Life: An Introduction to Biology (New York: Harcourt, Brace). Stebbins, G. Ledyard and Francisco Ayala (1981), “Is a New Evolutionary Synthesis Necessary?,” Science, 213:967-971, August 28. Sunderland, L.D. (1984), Darwin’s Enigma (San Diego, CA: Master Books). Thewissen, J.G.M., E.M. Williams, L.J. Roe, and S.T. Hussain (2001), “Skeletons of Terrestrial Cetaceans and the Relationship of Whales to Artiodactyls,” Nature, 413:277-281, September 20. Thompson, Bert (1989), “Hopeful Monsters” and Evolution: Punctuated Equilibrium Examined,” Reason & Revelation, 9:5-8, February. Thompson, Bert (1994), “Bacterial Antibiotic Resistance—Proof of Evolution?,” Reason & Revelation, 14:61-63, August. Thompson, Bert (2002), The Scientific Case for Creation (Montgomery, AL: Apologetics Press). Verrengia, Joseph B. (2005), “Fossils Show a Mammal Turned Tables, Devoured Dinosaur for Last Meal,” [On-line], URL: http://www.cp.org/english/online/full/science/050112/g011204A.html. Wieland, Carl (1994), “Antibiotic Resistance in Bacteria,” CEN Technical Journal, 8:5-6. Wieland, Carl (1997/1998), “Superbugs not Super After All,” Creation, 20:10-13, December 1997-February 1998. “What Really Killed the Dinosaurs?” (2002), “Letter from Discover,” Discover, 23:35, June.